This right here is a tiny horse, alongside a customer, in an Apple Store. Yes, I did a double-take too. What? Where? How? Why? Who knows! 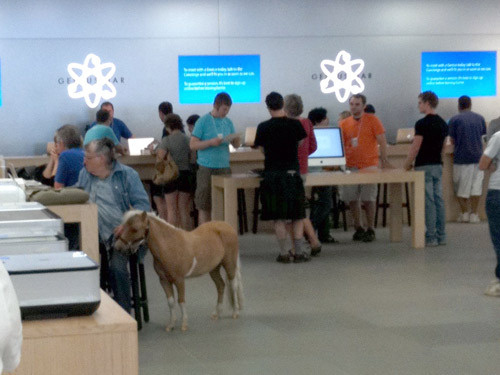 But one of our readers sent in this (maybe) unusual picture of a guy inside an Apple store with a miniature horse (pony?) next to him. Perhaps the best part about this picture is that everyone else in the store is ignoring it and totally nonchalant, maybe seeing a pony in an Apple Store is not so unusual after all? As an animal lover myself, you know if Apple allows it, then hey, why not? Perhaps it’s a registered therapy pony or a service horse? Or maybe it’s just someones pet and they brought it along? Or maybe the little horse just wanted to check out the latest Apple gear? Maybe the horse was contemplating an upgrade to a new iMac? Update: As a few commenters pointed out, the pony appears very likely to be a service animal. In that case, obviously the horse would be allowed to enter into any building as it assists the accompanying individual. So good for that customer for bringing their pony along! Whatever the explanation and whatever the reason, what a great picture, huh? I noticed that the man is in a wheel chair. That would make the miniature horse a service animal. Are animals allowed in stores? Service animals are required by law to be permitted in places of business that are open to the public. I do not believe this story, a baby horse is not a seeing eye dog. What happens when the horse becomes a full grown beast? Gallop through the shopping mall? Hardly a nimble assistant. Its not a baby horse. It’s a miniature horse. The size you see in the picture is the full grown size of the animal. Is this for real? Do they use them like dogs? Its for real. I don’t know how they would be better then a dog or how they could be trained but its being done. Service horse? I’d call that total abuse of a well-intentioned law. Exactly what function does a horse perform, and who gets to clean up after it when it fouls the floor in this public place? Just so everyone knows, though, the horse is not wearing the appropriate service handle which is more of a harness for the horse.